A two seat, high wing, single engine tractor configuration, the wing structure features a classical twin aluminum spar; the spars, the molded wing ribs and flap/aileron components are made from sheets of Al 6082-T6 or 6061-T6. All aluminum parts are CNC machined and protected by Alodine; a further layer of wash primer is applied where the fabric is glued to the structure. LH and RH wings are mated to the fuselage through a center cabane and extruded aluminum lift struts. All the wing, flaps and ailerons are covered by fabric, riveted to the ribs. The fuselage structure feature s a TIG welded chromium molybdenum steel truss with integral wing fittings, vertical stabilizer, plywood frames and fabric covering. All the steel tubes are internally protected by a MIL-SPEC anti-corrosion treatment that leaves a waxy protective layer over the surface. The untwisted, cantilever main wing features a rectangular planform with rounded tips, 1 degree dihedral from fuselage centerline and classical NACA4416 wing section at full span. The empennage features flat horizontal and vertical tail surfaces. Push-pull rods for ailerons and elevator, 3/32in steel cables for rudder control. The aircraft is trimmed by the electrically actuated stabilizer. The wing flaps are electrically actuated as well. Tail-wheel tricycle type; fixed main gear on steel struts with rubber shock absorber, hydraulic disc brakes and 6.00x6 wheels. 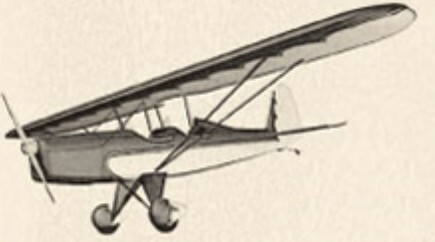 The swiveling tail-wheel is connected to the rudder; it can be disconnected on the ground by removing a quick disconnect pin. Tandem configuration with individual open cockpits (pilot in the rear seat); central stick controls, rudder pedals and throttles for both seats. Two luggage compartments, both with 44 lbs (20 kg.) capacity, one in the front and one in the rear. The 14 VDC electrical system is powered by one engine driven alternator/generator and provides power for the flaps, trim, fuel pump and radio rack. The fuel is kept in two internally fitted aluminum tanks (one in each wing root), total capacity 31,6 US gallons (120 liters). The airframe can be equipped with different engines; firewall forward kits for the following engines were available: radial ROTEC R2800 (rated power 110 HP) and the MIKRON MIIIC (rated power 80 HP). Under development was the LOM M132A (rated power 120 HP). The engine drives a 2 blade wooden propeller. The kit comes complete from firewall to tail, including the fuselage, tail, and landing gear steel structure completely finished and TIG welded; no additional welding necessary; the spar caps completely riveted ready for assembly; pre drilled aluminum wing ribs; 6.00 x 6 wheels and hydraulic brakes; covering material (Dacron) and finishing tapes; steel firewall; aluminum fuel tanks with fuel level indicator; pre-cut steel/aluminum tangs, brackets; machined parts ready for assembly; polycarbonate windscreen; ready to install hand made Italian leather finishing; fiberglass head rest; complete AN hardware; electric flap/trim actuator; 2 seats with 4 point harness. The firewall forward kit (less engine) includes: engine mount, TIG welded, cowling; wooden propeller; complete fuel system, including gascolator and electric fuel pump; oil system; oil tank; complete hardware kit; and was available for the Rotec R2800 or Mikron IIIC engine. Options include full epoxy coating to steel structures; wheel fairing; classic style engine instruments set (5 pcs); passenger seat instrument panel with electronic tachometer and passenger brake system. ll parts are CAD designed and produced by CNC/laser cutting equipment to exacting tolerances and perfect finish. The LoCamp and HiCamp models are readly available as standard 49% kit.